Two reactions on hearing that Steve Howell and Brian Sullivan have written a guide entitled Peterson Guide to Bird Identification–in 12 Steps: (1) What? Another identification guide?, (2) Who? An identification guide by Steven N. G. Howell and Brian L. Sullivan? This should be interesting. Two reactions on receiving my review copy from publisher Houghton Mifflin Harcourt: (1) Small book, colorful design, (2) There really are 12 steps and they are not in the order I expected. Reaction on finishing the guide: Idiosyncratic text, personal approach, at times challenging, other times familiar material but not presented in a familiar context. This is an identification handbook worth reading whether you are a beginner or advanced birder. And, I need to read Steps 1, 9, 10 and 11 again. Especially 10, because, this being a book co-authored by Steve Howell, plumage quickly becomes a tutorial on molt. But, let’s back up a bit. What are the 12 Steps? Howell and Sullivan have taken apart the identification process and turned it around, placing macro aspects first in importance (location, habitat, season), followed by situational factors (lighting, distance), behavior of the bird (what it is doing and how it sounds), and, finally, what the bird looks like (structure, plumage, variation). Framing the process is a first step that asks if you are indeed looking at a bird (this chapter is also about taxonomy–more on that later) and a final chapter on the importance of note taking. In other words, you don’t even observe the bird closely until Step 7, and that is to observe behavior. You don’t look at structure until Step 9, three-quarters through the process, and that comes after listening to the bird (a victory for those ear-birders with good ears and listening skills). You don’t look at plumage–color, patterns, molt, the items we usually associate with identification–till Step 10. I had to give the order of these steps some thought. Don’t we all think about “the big three”–location, habitat, season–when we identify a bird? Isn’t this common sense? Well, yes, but I also remember my beginning birding class, and my teacher, the fabled Starr Saphir, instructing us to examine the structure and shape of the bird and its bill. And, I remember the struggles I had separating out residential birds from migratory birds and learning to use distribution maps. And, frankly, I still have problems with habitat; I tend to focus on the bird so much, I forget where I am. So, I’m thinking that the order of the steps does make sense, especially for beginning birders. And, it is a way into birding that is a lot less intimidating than examining bird bills. As if in expectation of criticism at the placement of plumage so far down the list, Howell and Sullivan challenge experienced birders to “be honest” and confess that most of the time they are identifying birds on the basis of location, habitat, and season, with maybe a quick consultation with a field guide, rather than on distinguishing field marks and structural features. If you’re familiar with the writings of Steve N. G. Howell, this attitude is not surprising. 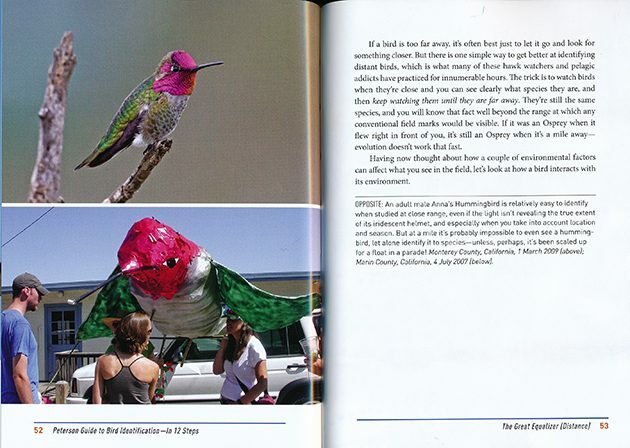 One of the most prolific birding writers of our time, specializing in birds of Mexico, hummingbirds, gulls, seabirds, molt, rarities, but not precluding other subjects like a forthcoming guide to birds of Chile, Howell has written and co-written at least 13 books and 35 ornithological articles. He has also educated, criticized, and prodded the birding community in articles, print and online, and letters mostly published in the American Birding Association’s Birding magazine. Chiefly, these articles address issues of taxonomy, listing, and field guides. “The Purpose of Field Guides: Taxonomy vs. Utility,” co-authored with Brian Sullivan, Michael O’Brien, Chris Wood, Ian Lewington, and Richard Crossley (Birding, November 2009) proposed a standard avian species order for field guides, apart from the ever-changing AOS taxonomic order. In the four-part ABA Blog series on subspecies, published in 2012, he argued we know too little about subspecies to use the term, and that birders should “show the characters of humility” and adapt alternative ways of articulating geographic differences. 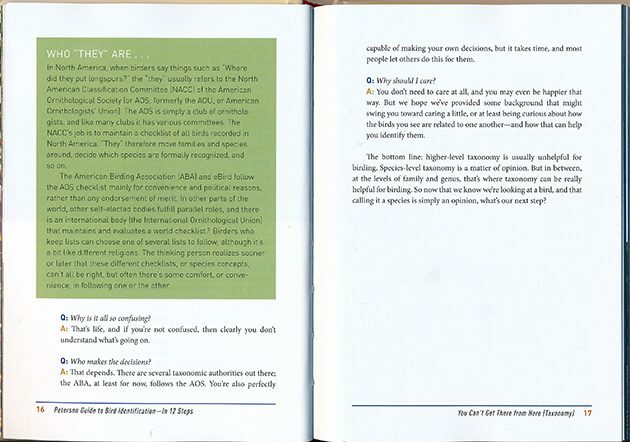 And, in a letter in the May/June 2013 issue, Howell commits himself to encouraging “the many people who use bird checklists to think for themselves, to actively engage and question the various committees that pass judgment; and even sometimes to question the primary literature on which decisions are based. We all make errors. Hopefully we can learn from them. ” (page 13). These comments make sense if you are familiar with the larger body of Howell’s critiques of molecular ornithological research as applied to taxonomic changes and of AOS taxonomic decisions in general. They makes sense if you consider that taxonomy and the concept of ‘species’ can be confusing, even an obstacle, to beginning birders. However, articulated in a short introductory chapter, they shortchange the ornithological community and science in general. It’s a slippery slope these days when you define scientific systems as “opinion,” and I think the ideas behind the words could have been expressed better. O.k., I got that out of my system! On to two chapters that I found fascinating–“Step 10: Feathers Make a Bird (Plumage)” and “Step 12: Write It Down (Notes)”. The first says it’s about plumage, but the authors quickly summarize color patterns in one paragraph as useful and shown in field guides, and spend the next ten pages talking about molt–feather growth. If you haven’t and don’t intend to read Howell’s 280-page Peterson Reference Guide to Molt in North American Birds, this is a good way to gain some understanding of a process that, when named, causes many birders’ eyes to glaze over. In addition to de-mystifying molt and explaining in baby steps something I never understood–how molt and plumage sometimes disconnect, the authors offer examples of how understanding the molt process aids in avoiding misidentification (a molting Raven may have a square tail) and narrowing down species identification. This chapter and the following one, “Step 11: This Bird Looks Different (Variation),” offer a lot for intermediate and advanced birders, principles and guidelines on observation, reasoning, and field guide use that you may already be using but maybe not in a conscious or consistent manner. 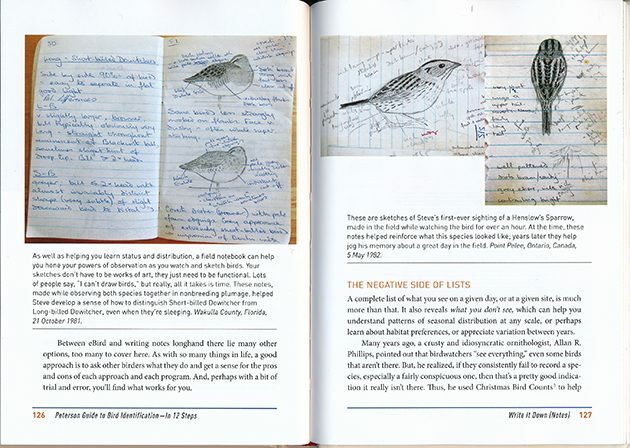 The chapter on taking notes is delightful, a re-write of Howell’s very personal 5-part blog series for young birders on field notebooks, expanded to include writing notes for eBird checklists. I did not know that there was a difference between field notebooks and field journals! The numerous examples of writings and sketches from Howell and Sullivan’s notebooks and computer files make me want to pack some soft drawing pencils and one of the larger notebooks on my shelf (my daughter gave me several for my birthday three years ago which have gone unused in the age of smart phones) into my backpack; at the same time I’m reassured by the authors’ exhortations that it is my choice how much work (because keeping notes is work) I want to put into the documentation process. 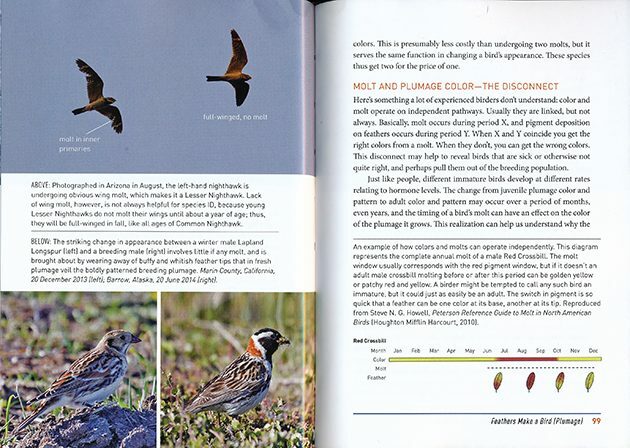 As you can see by the photographs included in this review, the Peterson Guide to Bird Identification–In 12 Steps is a compact, colorful, well-designed book. The numerous photographs (most by Howell, some by Sullivan), are used to illustrate textual points and are heavily captioned to make sure we know what exactly that point is. Most of these examples are of Western birds (both authors live in California), but that really does not detract from the learning process. In addition, full-page illustrations begin each chapter, even the Index. Some readers might think this is photographic overkill, I’ve decided that it contributes to a book package that is always fun to open and peruse. In addition to the Index, back-of-the-book material includes chapter notes, and a very selective list of books and websites for “Further Reading.” A glossary would have been helpful, but the thorough index serves as a good substitute. I’ve never met Steve Howell or Brian Sullivan, but I like to imagine that talking to them is similar to reading the Peterson Guide to Bird Identification–In 12 Steps, which is written in such a colloquial conversational style that I was surprised to realize that the authors were also carefully structuring each chapter, subtitling topics and summarizing main points at the end, like a good textbook should. This is a deceptively good book. And, let’s face it, if you are going to have a book-based conversation with bird experts about identification, Howell and Sullivan are going to be at the top of the list. I mentioned above that Steve Howell is a prolific writer. Here are some of his titles: A Guide to the Birds of Mexico and Northern Central America (with Sophie Webb, 1995), Hummingbirds of North America: The Photographic Guide (2003), Petrels, Albatrosses, and Storm-Petrels of North America: A Photographic Guide (2012), Peterson Reference Guides to Gulls of the Americas (with Jon Dunn, 2007), Peterson Reference Guide to Molt in North American Birds (2010), Rare Birds of North America (with Ian Lewington, 2012). Howell was awarded the ABA Robert Ridgway Award for publications in field ornithology in 2005. He is also a tour leader and has written a popular book on flying fish. Brian L. Sullivan is no slouch when it comes to writing; he has co-authored The Crossley ID Guide: Raptors with Richard Crossley and Jerry Liguori (2013); Better Birding: Tips, Tools, and Concepts for the Field with George L. Armistead (2015), another excellent book on bird identification, though very different from this one; and, with Steve Howell, two companion books on Offshore Sea Life ID Guide: East Coast and West Coast. Sullivan works on eBird and digital projects at the Cornell Lab of Ornithology. Many books have been published on bird identification; I’m including here introductions to North American field guides, advanced id guides like Better Birding: Tips, Tools, and Concepts for the Field, and other titles in the Peterson series, including the recent Peterson Reference Guide to Birding by Impression. Many more articles, in print and online, are available. The Peterson Guide to Bird Identification—in 12 Steps stands out for its construction of a framework that turns traditional identification processes upside down and inside out, its brevity (not to be mistaken for simplicity), a design that smartly balances text and illustrations, and its personal quality. This is not a ‘neutral’ textbook. It is a highly opinionated book reflecting the approach and thoughts of the authors. Which is exactly what makes it a book that all birders should read, consult, and maybe even, like me, read again. There is excellent learning material here, plus substantial challenges to our assumptions. Becoming proficient at bird identification and having fun attaining that proficiency may require both.